RC Jones, is a “witsmith”—our invented term for a person who can seamlessly mold wit using just words, a pen, and paper. 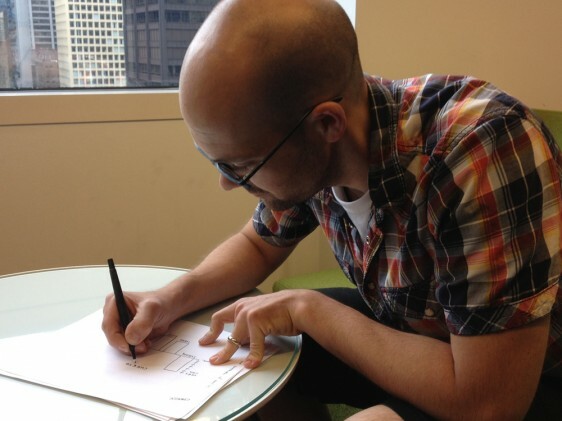 It’s no wonder that when our head honcho, Jen, first stumbled on RC’s Coolness Graphed Tumblr, she became instantly smitten with his hand-drawn graphs. Now, with the release of his book of the same title, Coolness Graphed, you too can bask in what’s cool and what’s definitely not. Also, this Idahoan-now-Chicagoan was named Time’s 2006 person of the year. Just check out his “résumé of sorts.”* Isn’t that incredible? 1. Why do you use bar graphs and not—dare we ask—pie graphs? Pie graphs sound delicious. But they work better for showing how percentages of a whole relate to each other, whereas bar graphs compare individual amounts that are somehow related. Plus, I’m much better at drawing straight lines than I am at circles. 2. Top three Internet items that made you laugh today? 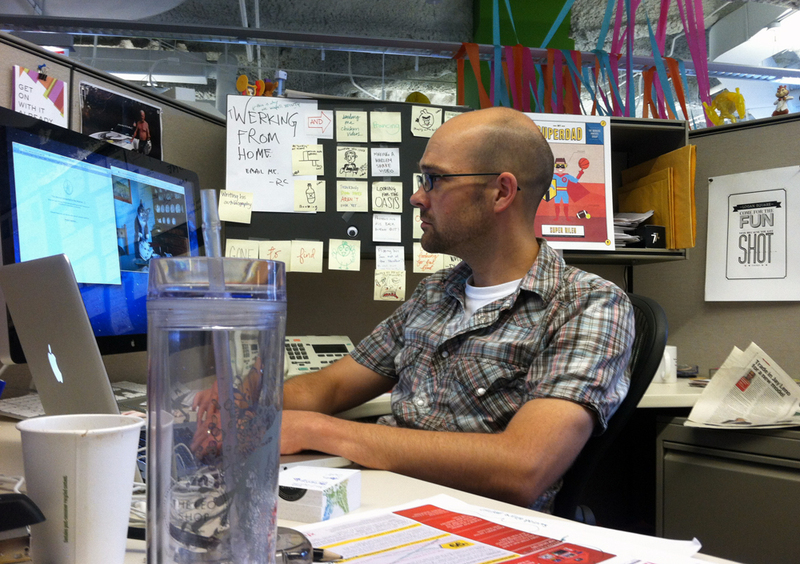 RC at his desk, surfing the Internet and breaking Safari. 3. Now the age-old question: dogs or cats? Cats that act like dogs. My cat is very down-to-earth and doesn’t have any cat attitude. She greets my family at the door, follows us around the house and sits next to us. I’ve never had the feeling she’s plotting to kill us. 4. Any hobbies outside of writing and updating your blog? I have a blast making up stories and silly songs for my son. He’s four. We are roughly at the same maturity level. 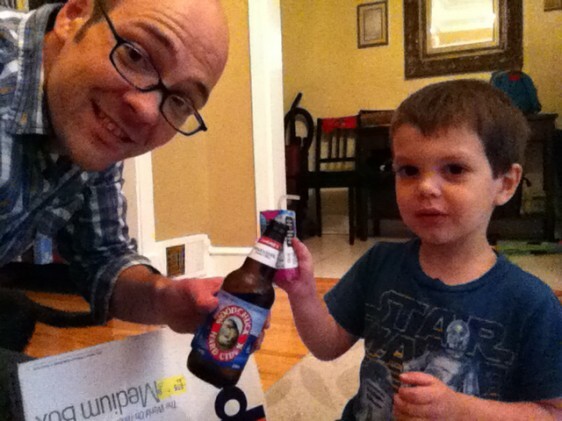 RC toasting the “Coolness Graphed” book with his son. We’ll toast to the adorableness of this photo. 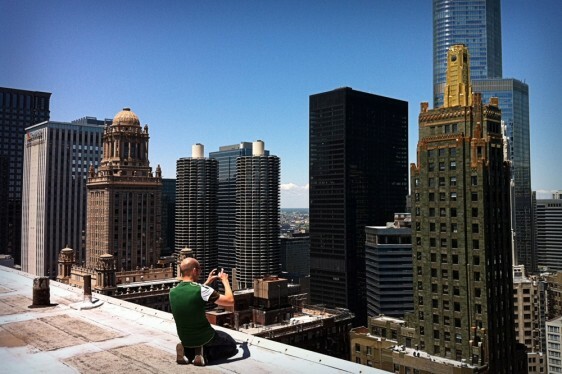 I also get plenty of kicks from climbing onto the roofs of buildings in Chicago. The Chicago skyline is beautiful, and I just can’t let all those rooftops go to waste. To clarify, if there’s a sign that says “No trespassing” I “no trespass.” But if there isn’t a sign, it’s fair game. Someday I will probably get in trouble for this. RC climbs buildings in Chicago. Don’t worry, RC. We won’t tell. 5. 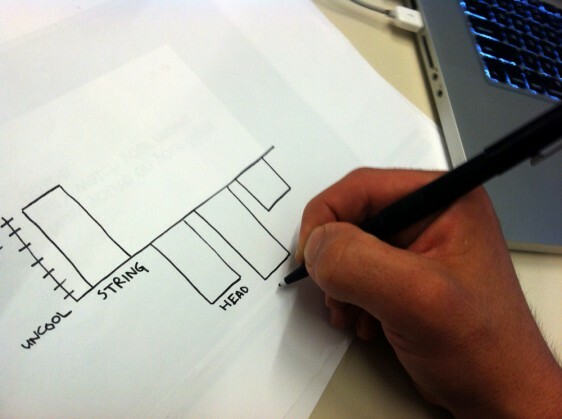 In the Coolness Graphed book’s intro, you wrote that one of the reasons you created the blog was to channel “creative frustration.” Do you have any organizational tips or words of wisdom on how to creatively de-stress for our fans? Start a side project. There’s something to be said for side projects being on the side. And from my experience, those are the ones that become popular. 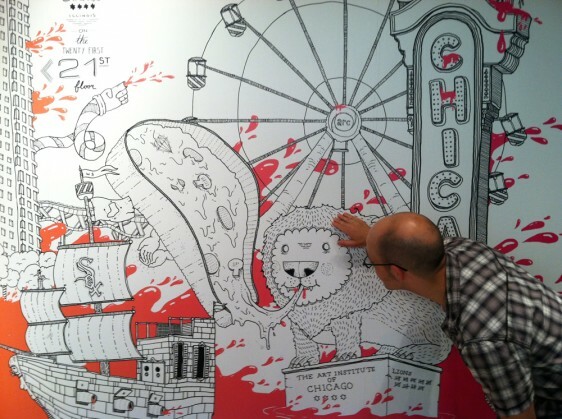 I’ve worked in advertising for five years, but none of the billboards I’ve written have ever come close to getting the same amount of attention as my two side projects: Coolness Graphed and Slightly Insulting Chicago Posters. With both of those projects, not having to account to anyone was key. The best kind of side projects leave you in charge, accountable to no boss or client. That way you’re free to make art you enjoy, which is crucial. It’s a creative pressure valve that releases pent-up frustration and irritation in a productive and creative way. RC exploring this mural of Chicago and perhaps petting this statue drawing. 6. 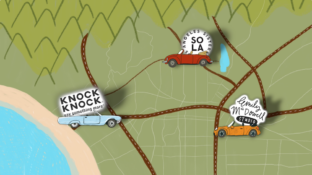 What’s your favorite Knock Knock product and why? (Aside from your book, of course!) My coworker and friend, Tara, gave me the Crap Stamp three Christmases ago. I wore it out. It was my first Knock Knock gift. What a great introduction. 7. If you could cook breakfast for any fictional or real person, who would it be and what would you cook for him or her? I’d cook pancakes for Jimmy Fallon. I’m not a very good cook, but I like making pancakes. I feel like Jimmy would be a blast to hang with. If The Roots could make it over, that’d be great. Justin Timberlake, too. Bonus question. 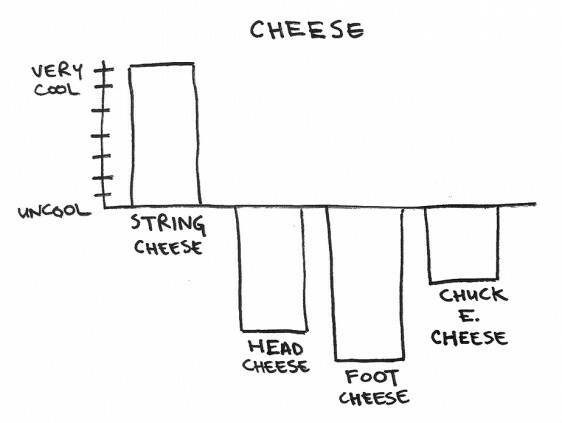 In “Coolness Graphed” form, please doodle your opinion on cheese. Make a couple of creative friends to bounce ideas off of if you don’t have any. And, when you think it’s ready, share your work with other people. None of my side projects would be what they are today if I’d kept them to myself. 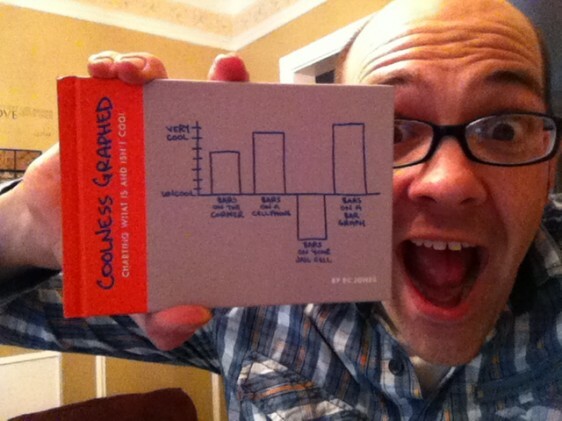 RC and “Coolness Graphed.” Pretty rad indeed. 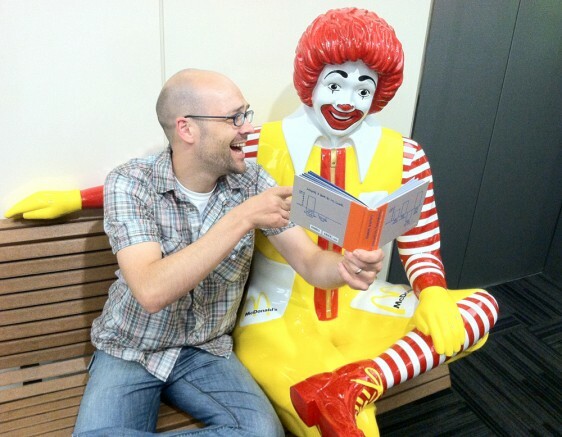 RC Jones is a top-notch, senior copywriter at Arc Worldwide. Read more of RC’s thoughts on Twitter at @likethecola. *Yup, he got us too.